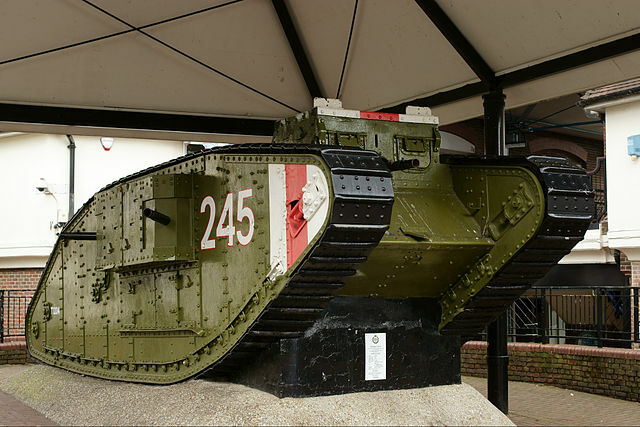 15 September 1916 The British Mark I was the world's first tank to enter combat. The British Mark I was the world's first tank to enter combat seeing action on the morning of 15 September 1916 during the Battle of Flers-Courcelette. The first full scale use of around 460 tanks was the Mark IV used en masse at the Battle of Cambrai in 20 November 1917. The rhomboidal shape was chosen to give as long a track run as possible to aid the crossing of the wide trenches on the Western Front battlefields. Bramah Joseph Diplock was an English inventor who invented and manufactured the pedrail wheel in 1903 and the pedrail chaintrack, a type of caterpillar track, in 1910. Richard Hornsby & Sons was an engine manufacturer. 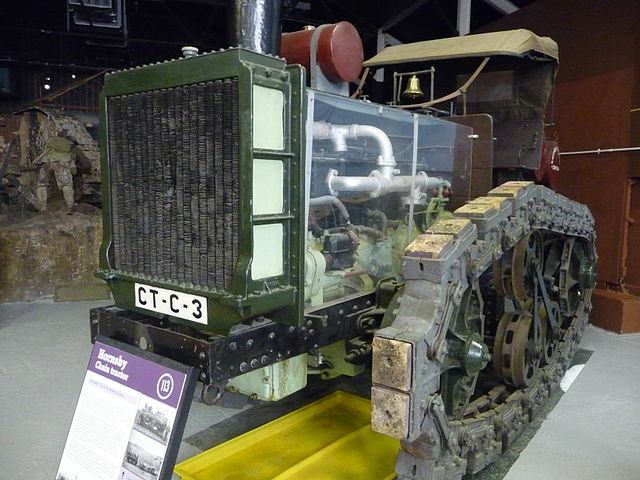 Hornsby's chief engineer , David Roberts, developed a Caterpillar track system for vehicles that was patented in 1904. This was demonstrated to the British Army. Due to a lack of interest he sold the patent to Holt & Co. (predecessor to Caterpillar Inc.) in America. H. G. Wells, in his short story The Land Ironclads, published in December 1903, described the use of large, armoured cross-country vehicles, armed with automatic rifles and moving on pedrail wheels, to break through a system of fortified trenches, disrupting the defence and clearing the way for an infantry advance. With recommendations from people like Ernest Swinton the Landships Committee, established by Churchill in February 1915, conducted experiments and tests of various vehicles in its attempts to create an armoured fighting vehicle. Eventually this lead to the favoured continuous track that is now familiar on modern tanks.